What is going on in Belarus? And in its ruler's head? AMERICA calls it the "last dictatorship in Europe". It has political prisoners, police crackdowns, state-run media and a security service called the KGB. So Belarus's image could do with polishing. Its irascible president, Alyaksandr Lukashenka, seems to accept this: Tim Bell, one of Britain's top public-relations men, was recently seen in Minsk, where he was in talks about a consultancy contract. As a Tory spin-doctor, he helped turn Margaret Thatcher into an election-winner. As Lord Bell he represents rich eastern Europeans such as Boris Berezovsky, an emigre Russian oligarch. EyevineMr Lukashenka's opponents have highlighted the irony that Lord Bell's visit was followed by a blitz on the opposition. Over 20 journalists from Belarus's independent media (chiefly foreign-based radio stations and small-circulation papers) were detained. The ostensible reason was an investigation into insulting cartoons of Mr Lukashenka on the internet. Defaming the president is a criminal offence. On March 25th the police violently broke up an opposition rally to commemorate the 90th anniversary of Belarus's short-lived statehood after the first world war. Around 80 people were arrested. Opposition activists were harassed as well: in Vitebsk, Yelena Borshchevskaya, a schoolteacher, was marched from her school by KGB officials and taken home, where they undertook a six-hour search in which they confiscated computer equipment, storage materials and a photocopier, as well as an identity card belonging to Olga Karach, a local politician. Shortly before the latest crackdown, Mr Lukashenka had ordered the American embassy in Minsk to cut its staff by half. On March 31st Belarus announced that it was reducing the size of its embassy in Washington and would expect America to make further cuts too. Yet only a few weeks ago Mr Lukashenka had seemed to be going in the opposite direction, putting out feelers to the West, allowing the European Union to open an office in Minsk and releasing all but one of his political prisoners. That reflected official nerves about an economic squeeze by the Russians, who are driving a hard bargain on gas. Russia has little sympathy for Mr Lukashenka's swaggering and bombastic ways. American sanctions on Belarus's main petrochemical company may have provoked the sharp response against their embassy, but they do not explain the wider crackdown. Some say there is a feud in Mr Lukashenka's circle, between those who want to keep control and those who think their only hope is rapprochement with the West. 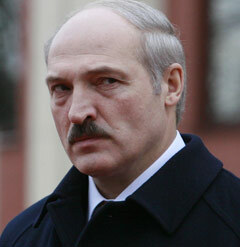 Or it may reflect the Belarusian leader's capricious thought processes. Lord Bell is used to difficult clients, but Mr Lukashenka may prove a tough challenge even for him.